But the big booths in West Auckland probably haven't come in yet, so I'm not so confident the majority for Hone will be as big as I predicted last night. Depending on how big the booths are the turnout may be at the high side of my estimate (the weather was much better than forecast - let's see if I can do better than the meteorologists). the total may only be around 12,000 - 14,000, maybe less. 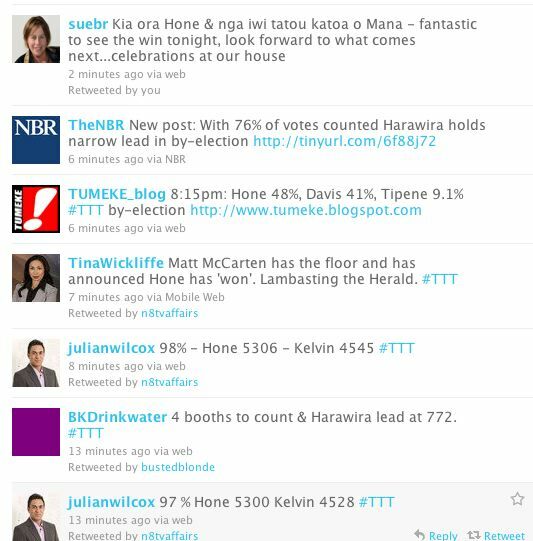 I would say the % vote is stacking up: Harawira 55%, Davis 35% Tipene 10%. Kelvin did better than I thought. Amazing what you can achieve with all the Labour MPs and their parliamentary services budgets and resources in tow, eh. As for Tipene. Ouch. Even worse than my 10% pick - not even into double figures, not even. They are at a low ebb at this point - destroyed and disheartened by this suicide stunt - and as I said earlier, now is the moment that Mana has to put the boot into what is left of the Maori Party. Matt McCarten has addressed the troops and Hone is now giving a victory speech. 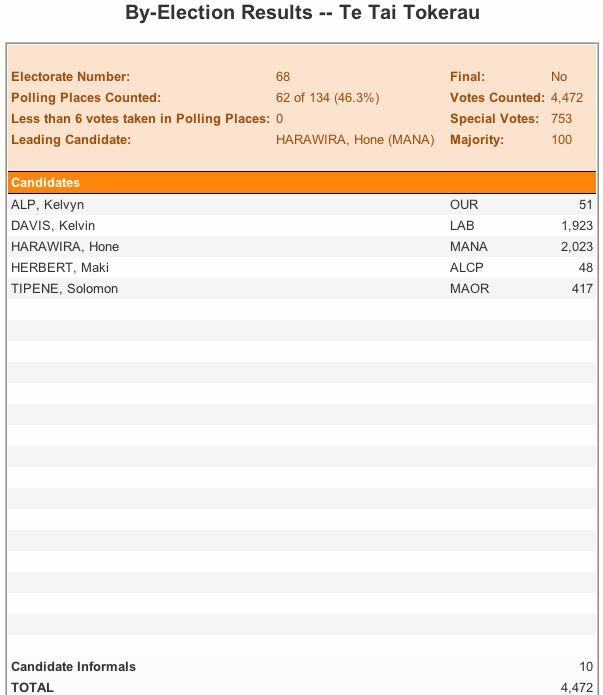 Bravo Mana Party, they deserve this win - they have earned it. Turnout 11,606 + 1,916 = 13,522 / 32,193 = 42%. Hone was on TV3 at 10:30pm and was wanting to talk with Pita and Tariana about re-establishing a relationship. On Mana's terms one would hope - things have changed and Tipene's sub double figure showing is the writing on the wall for the Maori Party. When they crossed to Kawakawa at the Labour Party do Phil Goff and Kelvin Davis were standing next to one another - Goff in front. Campbell asked Goff a question and off he went. Kelvin stood there like the mannequin he is, speechless. 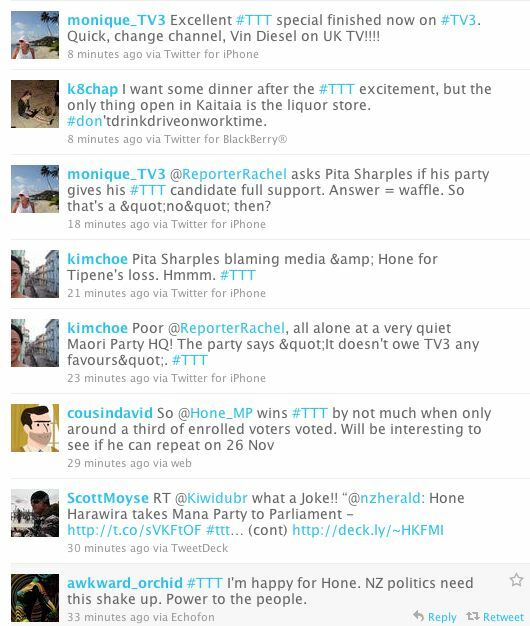 It was a good few minutes before Kelvin - the one who was actually in the election - got a word in. It was so embarrassing to see his mana stamped all over by Goff. Compare that to Hone being his own man and now a leader of a parliamentary party - what a difference. 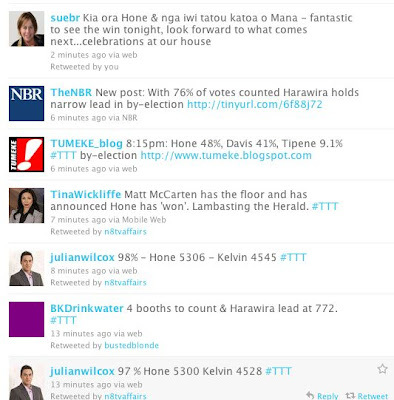 Congrats, a convincing victory to Hone and Mana - the Maori party losing so badly is just icing on the cake. Kia kaha Te Pati Mana. Now we have a choice for all voters to support Mana Party with a party vote in the general election. congratulations Hone and the Mana Party, you've earned your right to be in Parliament, well done! 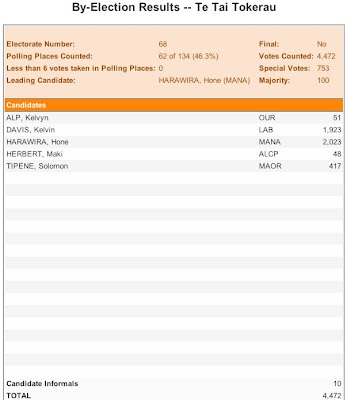 Congratulations go to Hone and the Mana Party who win the right to be in Parliament this term, well done and kia kaha!